The AquaCera W9334040 Teros Countertop Purifier allows users to have purified water on demand without having to install any permanent hardware. The W9334040 attaches to an existing kitchen faucet via a diverter valve, allowing water to be drawn into the Teros Countertop Purifier without having to make modifications to your plumbing. 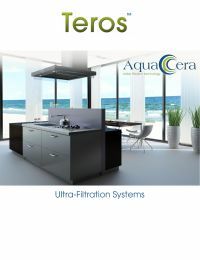 The Aquacera Teros Countertop Purifier utilizes a hollow fiber membrane and a AquaMetix block filter element to ensure a high level of purity while maintaining a >0.5 gallon per minute flow rate.